Three years ago turkey prices soared due to Bird Flu destroying more than 7.7 million turkeys in early 2015, causing the average cost of a Thanksgiving meal to hit a new record high. Bird-X reports the situation as the average Thanksgiving dinner continues to decrease in cost, and how to use humane bird control to avoid spreading Bird Flu. As the United States’ turkey population recovers from a massive Bird Flu outbreak in 2015, the average cost this year for a 16-pound Thanksgiving turkey is $21.71, or about $1.36 a pound, down from $22.38 in 2017. 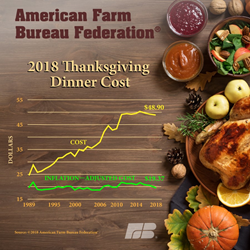 Thanksgiving retail turkey prices are the lowest since 2014, reports The American Farm Bureau Federation. Bird-X recognizes the seriousness of the Bird Flu. Most prevalent in aquatic and domestic birds, turkeys have a good chance in contracting the virus from uncontrolled wild birds, as well as spreading it further to other domestic birds and on occasion, to humans who handle infected birds. Since the virus is held within the bird’s saliva, droppings, and nasal excretions, other birds that come in direct contact with such substances have the possibility of becoming infected. This allows for fast and easy spreading of the disease—making it difficult to control and eliminate. Keep potentially infected pest birds away with humane ultrasonic bird control and bird spikes. Bird-X, Inc. has spent over 50 years protecting public areas from over 60 bird-spread transmissible diseases. The leading international brand of humane bird control solutions, this Chicago-based company manufactures a complete line of unique bird control products, protecting the health of humans, wildlife, and the environment by deterring birds from unwanted areas without harming them. For information on any of Bird-X’s humane pest control products, please call customer service at (800) 662-5021.